Keen to experience a getaway that will surprise you at every turn? Kagga Kamma should be at the top of your list. Where else would you be able to sleep in a cave, a hut or under the Southern Cross with nothing but Cederberg sky between you and the Milky Way? 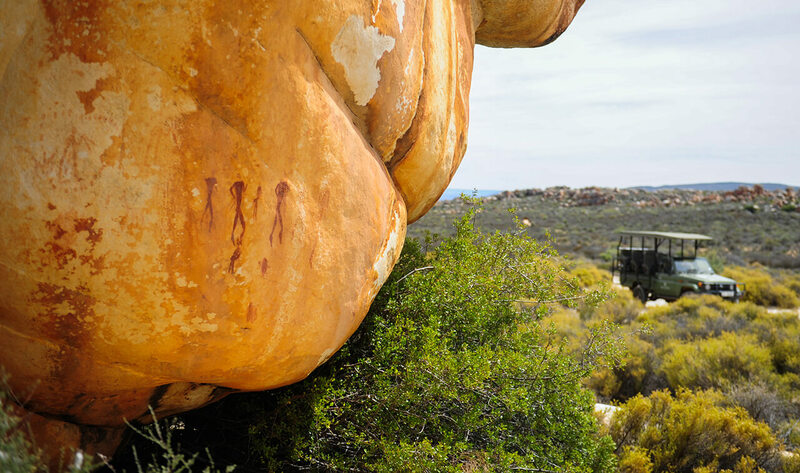 The story of how the extraordinary accommodation options at Kagga Kamma came to be takes us back thousands of years, to when the Cederberg was an untamed wilderness. A long time ago, the area that is now known as the Kagga Kamma Nature Reserve used to be the hunting grounds of the San. These fascinating indigenous people lived a nomadic lifestyle that could only support groups of fewer than 10, so they would make their way from one suitable location to the next, living off the land and hunting game as they needed. As such, they never really built structures to live in. They would take refuge under the overhanging rock formations for which the Cederberg is known, or fashion makeshift huts from the reeds that flourish in this area. Often, they wouldn’t even cut the reeds, but leave them rooted and tie the tops together to create a shelter without harming the plant. Then, when they moved on to their next destination, they would untie the reeds to continue their growth cycle in peace. Such was the way of the San – they only took what they needed and never more. Inspired by this legacy of treading lightly on the earth, the visitor suites at Kagga Kamma were designed to have minimal impact on the environment, be as energy-efficient as possible, and blend in with the surroundings so as not to detract from the area’s natural beauty. The Cave Suites give visitors the experience of taking shelter under a sandstone formation, and merge seamlessly with the background, yet have every convenience needed. Similarly, the Hut Suites have been constructed using reeds from the region as roofing, and feature a traditional semi-circular design that supports its own structural weight, while maximising natural climate control. And then, of course, there are the sought-after Open Air Rooms – the outdoor suites that may be booked over the summer months and give visitors a taste of sleeping under the stars, completely secluded, but in ultimate comfort. As you can tell, great care has been taken to give visitors to Kagga Kamma an authentic experience that will bring them closer to nature and hopefully, spark a lifelong interest in conserving our natural and cultural heritage. The team hopes to welcome you soon so you can get a taste of Kagga Kamma’s inimitable hospitality and experience this special place for yourself.